Good for picky eaters, TV dinners, and making life in the kitchen easier! If you’ve ever felt frustrated juggling the many little bowls holding your prepped ingredients, then I’ve found the tool for you. There’s even a good chance you already own it. Unlike the gaggle of various sized bowls that can be a pain to scoot aside, move around, and clear away, this unassuming sectioned tray keeps it all together, portable, and accessible. It is just the right size to hold all (or most) of the ingredients for one dish, and because it is flat and lightweight, you can effortlessly move it as a self-contained unit. Since there’s never enough counter space, you’ll appreciate that you can set it down in places beyond just the counter — try the top of the toaster oven, over a stable mixing bowl, or on a chair. The divided sections keep items separate, and the long narrow compartment is perfect for small amounts of aromatics, such as minced garlic and herbs. Every item faces an edge of the tray, making it easy to use a specific item just by scooting it into the skillet. Cover the filled trays in plastic wrap to store and be amazed at how you can slide the trays on top of the menagerie of containers in your fridge. When not in use, they stack and store vertically, so you can snake them into the spare gap next to your mixing bowls, or store them upright alongside cutting boards. If you are cooking for a crowd or have a large volume of certain ingredients, you won’t be able to fit everything on one sectioned tray. For example, you may need a large bowl of diced potatoes for potato salad, or to hold bread cubes for stuffing. Also, liquid ingredients are not well suited. However, I always choose this tray over the stack of prep bowls I would need to replace it. 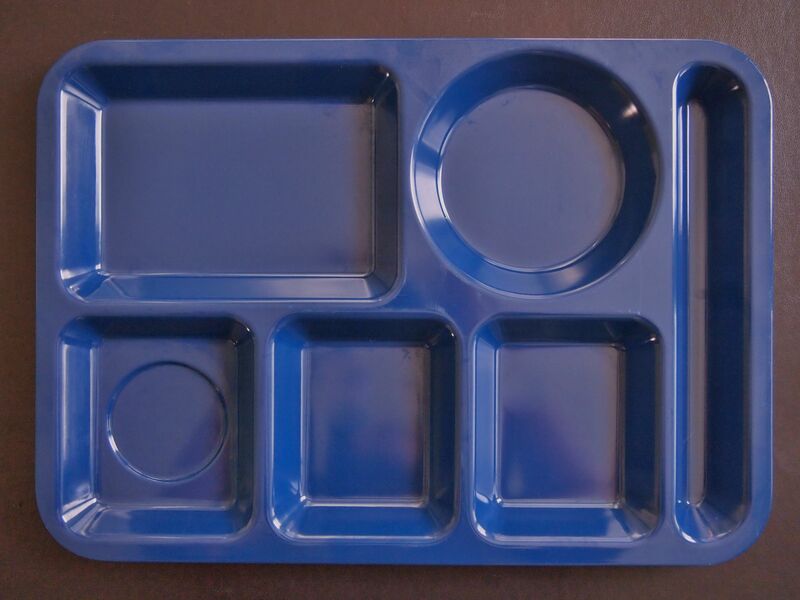 I have seen them called sectioned trays, divided trays, TV dinner trays, and mess trays. 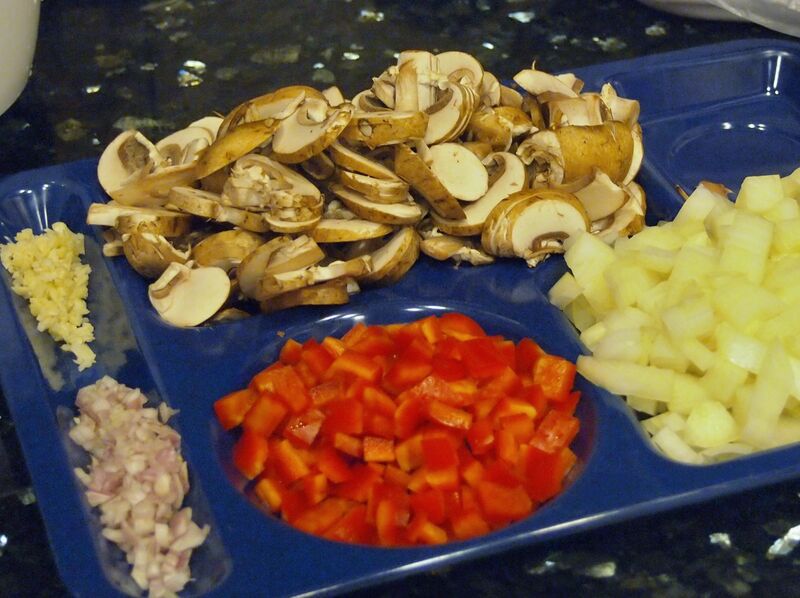 For our purposes of holding prepped ingredients, I call it a mise tray (short for mise en place). You should be able to score them at stores that sell home goods like Target or Amazon.com. Since the idea first came to me and I snatched up these trays for about $4 each, they’ve been a fixture in prepping almost every meal in my kitchen. That was years ago. Mise trays are oh-so-satisfyingly super-functional and retro chic to boot. I’m still excited about them! I think you will be, too. Do you own one of these trays? What tool, gadget, or helper is essential in your kitchen? Neat idea. I like the fact its just one less clean up. Love the mise tray name. I’m going to get some! I also love that you call it a ‘mise tray’. I would say another tool that I use often is my immersion stick blender…especially for soups. Hi Ardielyn, Nice to hear from you. Thank you! They say an organized cook is a happy cook. Mise trays make me happy :). So many less things to fuss with and clean. I hope you’ll give it a try. Hi Roberta, Thank you! I hope you’ll let me know how you like your mise tray after you get one :). Yes, I am totally with you, stick/immersion blenders are great! So much easier than transporting hot soup to a traditional blender. What A great tool. I have lots of neat gadgets. some I even forget that I have. that’s how many I have LOL. Great Blog. I am now following you on Twitter. Hi Marlene, Nice to see you. Thank you. Yes, it is easy to get carried away with the gadgets! Your blog is great as well. I see you have a very cute citrus juicer ;)!